Our Mission: To build homes, communities and hope for local families and veterans. Our Service Area: Ashland, Auburn, Barre, Boylston, Brookfield, Charlton, Douglas, Dudley, East Brookfield, Framingham, Grafton, Holden, Holliston, Hopkinton, Leicester, Marlborough, Millbury, Natick, New Braintree, North Brookfield, Northborough, Northbridge, Oakham, Oxford, Paxton, Rutland, Sherborn, Shrewsbury, Southborough, Southbridge, Spencer, Sturbridge, Sudbury, Sutton, Upton, Uxbridge, Wayland, Webster, West Boylston, West Brookfield, Westborough, and Worcester. If you live outside of our service area, please contact your local affiliate. No matter who we are or where we come from, we all deserve to have a decent life. We deserve to feel strength and stability day after day. We deserve to know we have the power to take care of ourselves and build our own futures. Through shelter, we empower. Because you, me, we–we’re all humans. And every one of us deserves a fair chance. Your support gives families the opportunity to help themselves. Homeownership allows families to save more, invest in education, live in healthier environments, and have more financial stability. It’s the foundation for success and a better future. With your financial support, your time, or your voice you can help create a world where everyone has a decent place to live. At Habitat for Humanity MetroWest/Greater Worcester, our motto is “A hand up, not a handout.” We are dedicated to building houses with families, not for them. We partner with hardworking families who earn between 30 and 60% of the area median income and do not qualify for other homeownership programs. Not only do Habitat families pay for their homes through a monthly mortgage, they also put in between 400 and 500 hours of sweat equity prior to becoming homeowners. 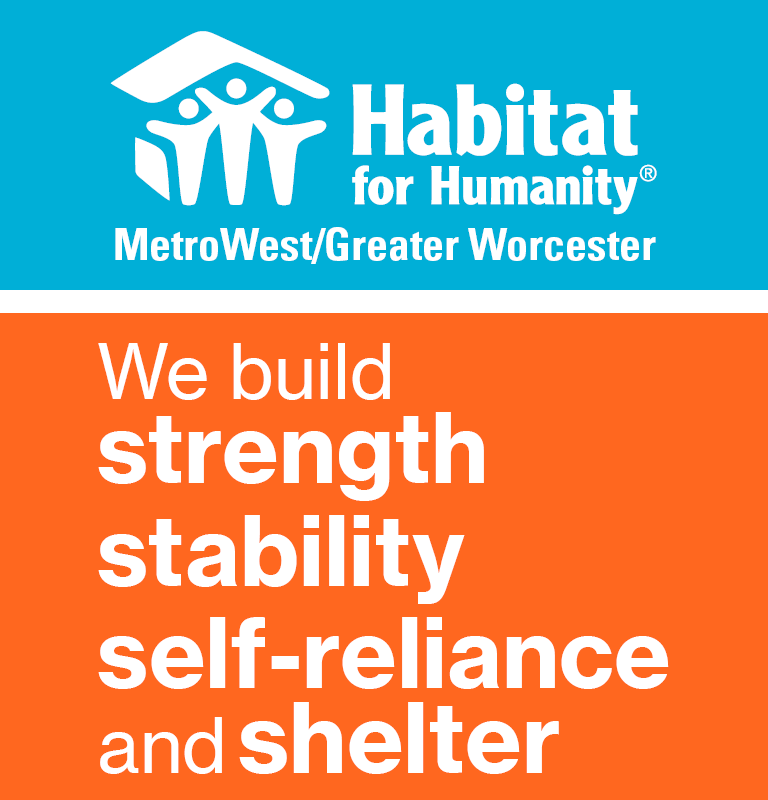 Habitat homes are built completely through donations and volunteer labor of individuals, organizations, businesses, and foundations throughout the MetroWest and Greater Worcester areas. Because of this we are able to sell our homes below market value to qualifying families. We convey our homes to qualified families at a price based on what they can afford to pay. People in your community, and all over the world, partner with Habitat for Humanity to build or improve a place they can call home. Habitat homeowners build their homes alongside volunteers and pay an affordable mortgage. With your help, Habitat homeowners achieve the strength, stability, and independence they need to build a better life for themselves and their families. All are welcome: Habitat for Humanity MetroWest/Greater Worcester has an open door policy: All who believe that everyone needs a decent, affordable place to live are welcome to help with the work, regardless of race, religion, age, gender, political views or any of the other distinctions that too often divide people. In short, Habitat welcomes volunteers and supporters from all backgrounds and also serves people in need of decent housing regardless of race or religion. As a matter of policy, Habitat for Humanity International and its affiliated organization do not proselytize. This means that Habitat will not offer assistance on the expressed or implied condition that people must either adhere to or convert to a particular faith, or listen and respond to messaging designed to induce conversion to a particular faith.